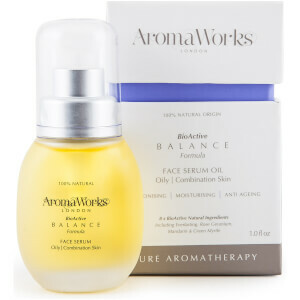 Catering specifically for oily and combination skin types, the Balance Face Serum Oil from AromaWorks helps to clarify, hydrate and decongest your complexion, leaving it fresh and radiant. 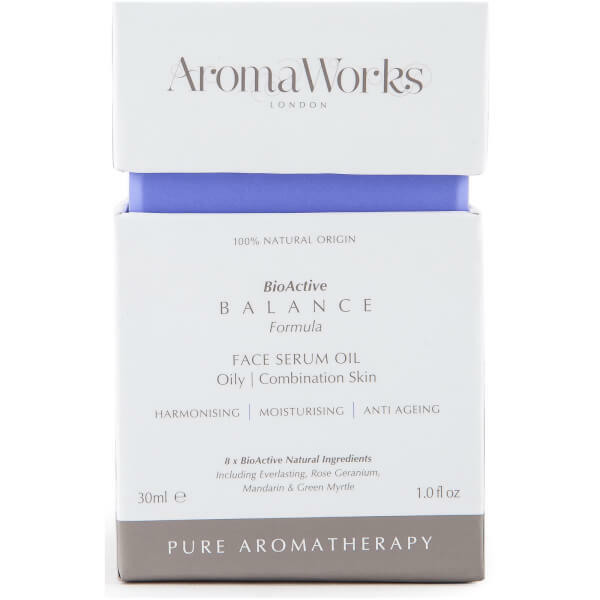 Harnessing the powers of Jojoba Oil, Organic Sea Buckthorn and antioxidant Vitamin E, the rebalancing formula targets uneven skin tone and texture, whilst revitalising and rejuvenating to reveal a clearer, more refined complexion. Delivers a luxurious fragrance blended from notes of Mandarin and Myrtle, enhanced by floral accords of Rose, Geranium and Neroli, on a rich Patchouli base. Skin is soft, smooth and restored. Apply a small amount to the face and neck before face cream. Capric/Carprylic Triglyceride, Simondsia Chinesis (Jojoba) Seed Oil, Moringa Oleifera Seed Oil, Citrus Nobilis (Mandarin Orange) Peel Oil, Bergamot (Citrus Bergamia) Fruite Oil, Lavandula Angusifoia (Lavender) Flower Oil, Citrus Aurantium (Neroli) Oil.